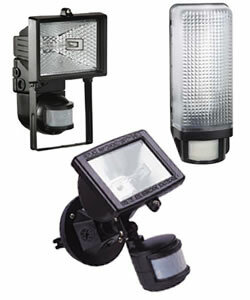 Outdoor Security Lighting from Hi Amp Electric creates a safer environment for your home. Sleep easier with the help of this full-service, turnkey program that provides complete outdoor lighting systems for Western Washington State homeowners. Let us help you create a lighting system that meets all your needs. One of our service technicians will visit your property to design a lighting plan tailored to your requests. Lights can be installed on existing utility poles or on specially placed poles based on the necessary level of lighting. The guidelines listed below will help you ensure that your security lighting does the job it is intended to do without causing reduced visibility for passing motorists, light trespass (spilling of light into areas where it is not wanted or intended) and energy waste. You'll also help preserve the stunning view of the night sky. Lighting installed for walkways and driveways should be directed downward. There are many different ways that home security systems can help protect your Pacific Northwest home and your family, and there are many families who take advantage in having home security systems installed in their place of business or their residence, and benefit from knowing their homes and their families are well protected. Home security lighting has fast become an addition to having a home security system protecting your valuable belongings, and you have the ability of choosing how you would like home security lighting to help keep your home safe from burglars and unwanted intruders. One choice that some individuals prefer would be the dusk to dawn style. In choosing this style, there are lights in different varieties, which will stay on continuously, set around your Washington home. Lights that are constantly on will give intruders the impression that someone is home, and they generally will stay away because of this fact. Even though this style works well in deterring intruders or burglars from entering your home, it can become very expensive with the cost of energy. Motion-activated flood lighting is another style in using home security lighting at your home or place of business. Motion sensors are used to detect any motion on your property, which will turn the high powered flood lights on when the sensor catches any motion, then they turn back off within a couple of minutes. Most burglars will leave your home once the lights are activated. As you explore all advantages in home security, you should take into consideration home security lighting and how it can help keep your home safe.